Before the semester began, history professor Bill Green spent some time last week getting re-acquainted with his Memorial Hall office. After a four-year absence, he noticed how the ivy now covers his window. He enjoyed the familiar feel of his chair and discovered a book he had been searching for sitting on his bookshelf. In January 2006, Green was asked to step in as interim superintendent of the Minneapolis Public Schools to begin to restore stability in the district at a difficult time. The interim position turned into a permanent one, which he held until June 30 of this year. There was never any doubt he'd return to teaching and Augsburg, and he never saw the move as a career change. He even found himself infusing historical teaching moments in speeches and lectures he gave as superintendent. "What I really missed was the luxury to think more deeply," Green says. "I had to fight for time to be reflective, with so many fires, issues, and critical tensions to deal with...and I look forward to being back and thinking two or three levels deeper." This semester Green is teaching day courses in civil rights history and American legal history, and U. S. history in Weekend College. He looks forward to being in the classroom again. "I want students to not only learn the material, but I push them...how do they feel about it, how do they see the world, and who are they inside?" Green returns to campus with clearer understanding of the enormous challenges faced by Minneapolis public schools, as they try to educate a majority of students who are of poverty and of color, with increasing numbers of new immigrants. He says that programs like Augsburg's that support students in various ways offer some of these students "the opportunities to find the talent within themselves." Green has also missed time for writing. This summer he finally could tackle comments he received last fall concerning chapters in a manuscript. 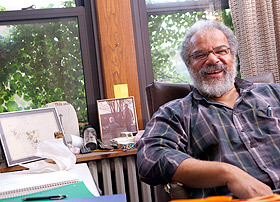 A sequel to his first book, A Peculiar Imbalance: The Fall and Rise of Racial Equality in Early Minnesota, is on his to-do list, as well as ideas for a novel and play. He's also been asked to write about leadership and school reform. Green is anxious to catch up on what has changed at Augsburg in four years—a new president, new programs, and, of course, all new students.